Dev Diary #8 and 9: Recruitment and Giving Orders! Today I finished the Recruitment screen, which allows you to recruit new crew members for your gang, which is obviously huge. It works super smooth: just click on the recruit button on the main menu, then click on the portrait of the guy you want to recruit into your group, paying that first year's salary. That's it. It will pop back to the HQ screen with your new guy filled in. The 3 choices rotate out and change every turn, so there's always fresh blood if you don't like the choices in a turn. You can only recruit 1 guy per turn, so careful choices have to be made, obviously. Next i'll be setting up the action options for each of your guys, which will be pretty varied. Really liking how this looks so far! Glad to have you back. I've got the order assignment in and working now. The procedure is fairly simple: Just click on a street, then on a guy's pic, then on what you want them to be doing next turn on that street. That's all there is to it! 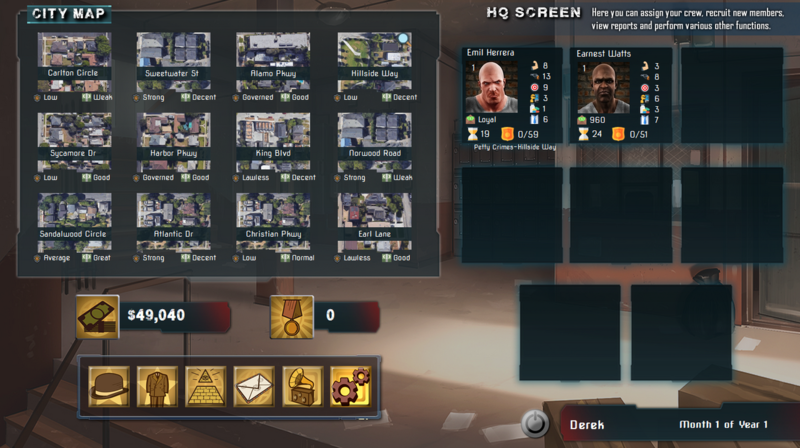 The street will stay locked until you select a different one, so if you want to assign a guy to the same street, you don't have to click it again. You're not locked in, you just click on the guy's pic again to change it. 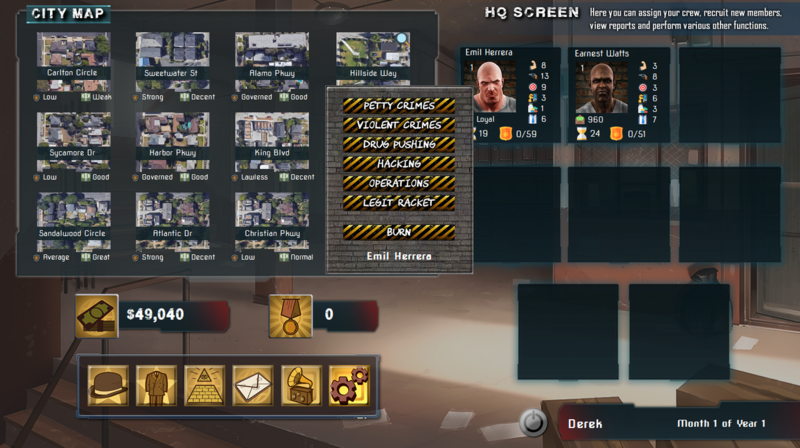 The game will include a little Help popup that will explain each type of activity and their risks and rewards. bump so people can see this thread on the front page. I was wondering if their are gonna be females available for hire or not? Is it just males? Probably just males for now, due to art issues. But maybe later, it can fit in just fine.